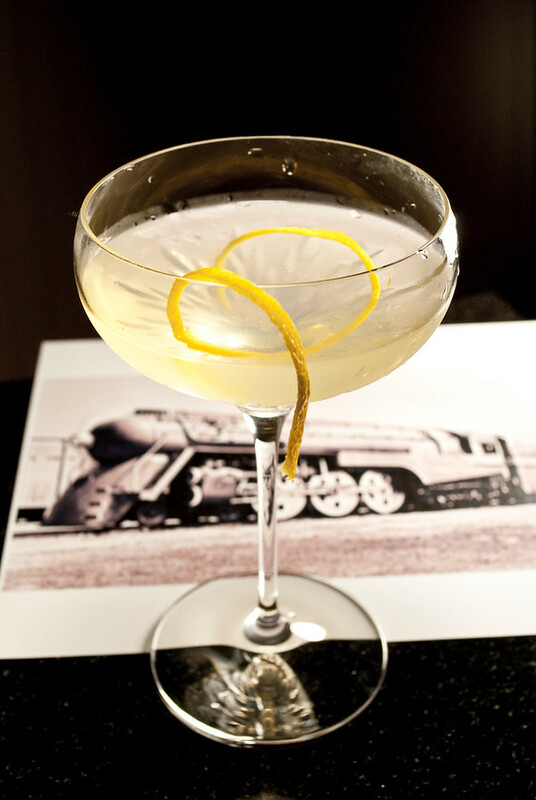 The Twentieth Century Cocktail, according to lore, is a celebration of Henry Dreyfuss’s gorgeously Art Deco Hudson locomotive, introduced in 1938 to power the New York Central’s 20th Century Limited cross-country passenger trains. The story is a little dodgy, as the cocktail’s formula was published in the 1937 Café Royal Bar Book , a year before the engine’s introduction, but obscure and dubious origins are part of the aura of classic cocktails, and the near-miss timing on the Twentienth Century offers ample room for speculation. Since the drink’s inventor left no clues, it pleases me to believe that the locomotive story is true. I can’t help but wonder what that original maker was thinking when he put these ingredients together for the first time—the Twentieth Century combines gin, Lillet blanc, lemon, and chocolate, flavors that don’t naturally come to mind as close cocktail buddies. I made many variations of this this drink, and proved to myself that a palatable blend is elusive, and that the margin of error between brilliance and dreck is vanishingly small. Not enough cacao, and all you have is a nasty and acidic martini; too much, and you have an unappealing and overpowering aftertaste of cheap chocolate; if you hit right in that narrow groove where all is in balance, there is subtle and surprising pleasure. Despite the chocolate, the Twentieth Century is a proper cocktail, deserving of its classic status. It is not sweet, and can be served at the cocktail hour or as a pre-dinner drink. If a chocolate “dessert drink” is in order, the Twentieth Century is far superior to the much-reviled chocolatini; if you don’t need sweets and you’re in no hurry to get to your whiskey, this might be considered a dessert cocktail for grownups. Shake with ice and strain into a chilled cocktail glass. Express and garnish with lemon. The crème de cacao can easily overpower this drink; less is more. Even the ¼ ounce listed here may seem too much for some. The effect can be made extremely subtle by just washing the glass with the cacao instead of adding into the shaker—beware the lemon if you cut back this far. I was also surprised to discover that the Lillet strongly influences and attenuates the prominence of the cacao. The Twentieth Century opens up an interesting challenge at the cocktail hour: to find hors d’oeuvres that pair well with this subtle, acidic chocolate blend. My chef recommends that we start with pecans, try fruits like pears, and avoid salt. Ted Haigh says of the Twentieth Century in Vintage Spirits and Forgotten Cocktails , “With this cocktail, I believe we now have a firm idea of exactly what Art Deco tastes like.” The “taste” of Art Deco is a bit of a stretch for me, but this is a taste that provides a gorgeous reward for your care and effort in achieving that delicate flavor balance. “Twentieth Century Cocktail” at cold-glass.com : All text and photos Copyright © 2010 Douglas M. Ford. All rights reserved. In honor of the dubious history of the name, I packed my citrus press and shaker on the overnight train from San Francisco to Seattle and made these in my sleeper compartment. I substituted simple syrup and chocolate bitters for the creme de cacao and it was fantastic. Chocolate bitters, good idea. Thanks! Excellent. I think chocolate bitters would be an excellent experiment with the Twentieth Century. I look forward to giving it a try. I stumbled across another Twentieth Century cocktail in Jack’s Manual by J.A. Grohusko, 1916 edition. Definitely not named after the train! It combines bourbon, lemon, lime, a dash of rum topped with ginger ale or seltzer..